The pattern states: With crochet hook and scrap yarn, chain 26. With 1 dpn, pick up and k 24 through the sts of the back of the chain. Do not join. Knit one row. Next row Purl. 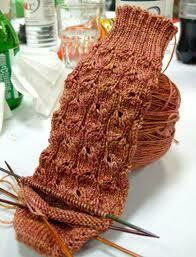 Carefully remove scrap yarn, placing open sts on 2nd dpn. Rnd 1 With free dpn, pm for beg of rd, and k 12 of the new sts; cont around, distributing sts evenly on 4 dpn-48 sts. I am totally confused with this. I consider myself an intermediate knitter, but I have never come across this before. I don’t understand how they are ending up with 48 stitches. I think I am going off track when they are picking up stitches on the back of the chain. 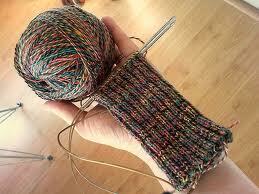 Make sure that the scrap yarn you are using is a completely different color then the yarn you will be knitting with. So if you are knitting with black yarn, I suggest you use white yarn as your scrap yarn. Having a sharp color contrast between the two makes it easier to see what you are doing. The scrap yarn acts as a holder for your ‘live’ stitches’, that you will create. After you’ve picked up and knit 24 stitches on the crochet chain, knit one row and then purl the next row. Leave those stitches on your double-pointed needle. Now, with another double-pointed needle, you will then remove this scrap yarn, making sure to pick up each little ‘hump’ created by your knitting yarn. 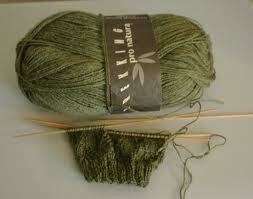 You are basically taking each stitch off the scrap yarn and placing them on your knitting needle. You picked up 24 stitches to start with, so with the other needle you will have the same 24 stitches taken from the opposite end, thus equaling 48 stitches. 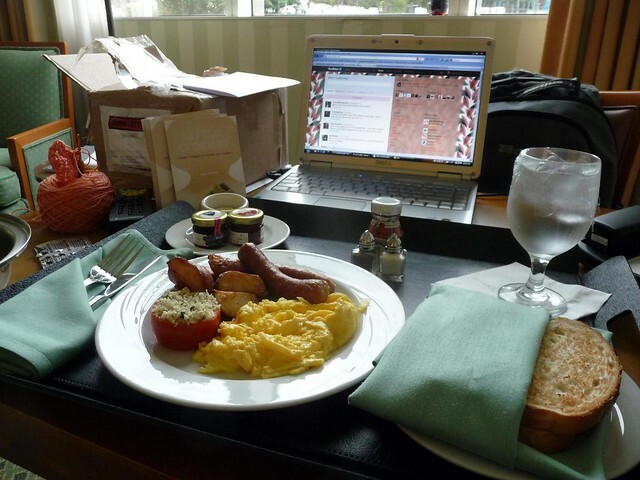 While I’m eating, I’m usually doing something knitting related. Either reading a knitting magazine, writing in my knitting journal or actually doing some knitting. There is just something about knitting and eating that just seem to go together- even though knitting wisdom would tell you it is not wise to knit with food around. 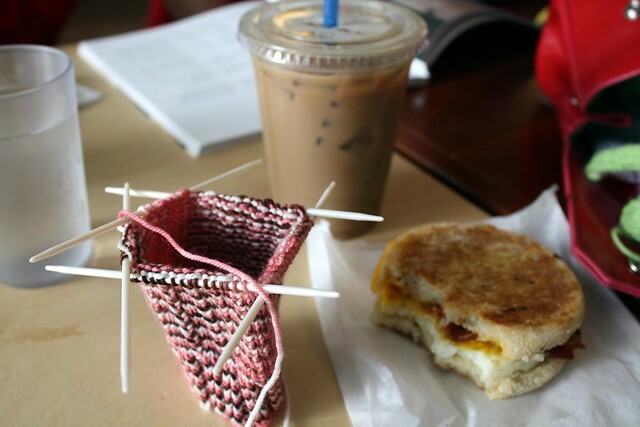 Never had knitting with breakfast? I strongly suggest trying it. 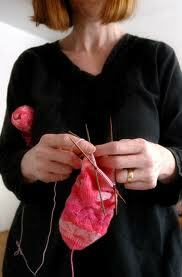 Knitting is a great way to balance out those morning jitters you keep getting from your double shot of espresso. Not a breakfast person? Why not use breakfast as another excuse to get in more knitting time. And besides, isn’t your doctor always telling you that you need more fiber in your diet? 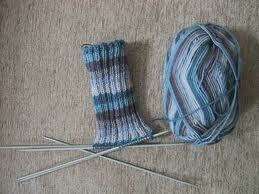 I am addicted to looking at pictures of knitted socks in progress. Something about seeing a sock just started is thrilling to me. 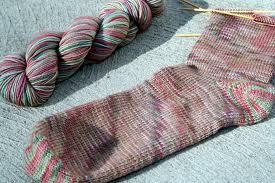 My mind is curious about how the sock will evolve the patterns, the texture, the colors. 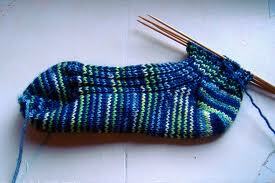 Seeing half-finished socks also shows me how proud sock knitters are of their work. Most writers would never show a draft of their writings. And a painter would never think about showing a painting that’s only half completed. 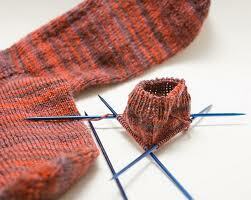 But us sock knitters will show you the entire process from start to finish. To us, the art is not in the finished product, but in the process of making it. I simply love that about us knitters. I can’t help it. 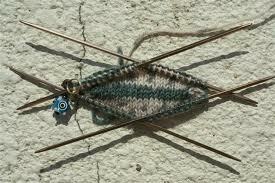 Even before I finish stitching up one pair, I’m already thinking about the next sock I’m going to knit. 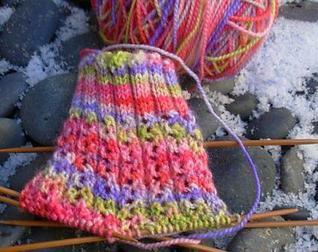 This is my current sock project. It’s the one I was telling you about before. I couldn’t find the size 3 straight needles I wanted so I bought a pack of double-pointed needles and put point protectors on the ends of two of them. They make just the right size needles for me. And, should I ever lose one, I have two extras. As you can see in the picture, I’ve knitted the cuff and leg of one sock. 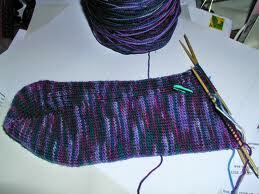 I moved the sock to a spare needle for now and will start work on the other sock. So, why did I stop at the leg? Well, we have guest in town right now and when I do the heel flap and heel turn I really like to have uninterrupted time to concentrate. 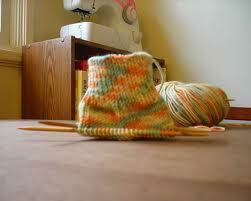 I find that with distractions the less-then-one-minute job of turning the heel turns into an hour ordeal. And people tend to frown at you when you tell them, “Hush! 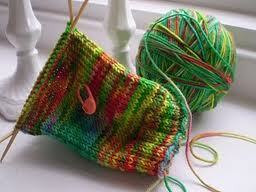 I’m turning the heel.”. The self-striping yarn didn’t knit up the way it shows in the sample picture on the yarn wrapper, but I really do love the other pattern it formed. I never liked being like everyone else, so the fact that my pattern doesn’t match the pre planned one this yarn was designed to make just makes these socks even more perfect. I’ll post another picture when I get one fully completed. 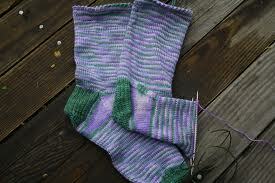 For those of you who want to know, the yarn is Patons Kroy Socks Jacquards. The color is Denim Jacquard. It is 50 grams/1.75 oz., approx. 166 yards. Fiber content is 75% washable wool and 25% nylon.